One could consider Stephen Neal the quintessential New England Patriot. He didn’t play college football, but rather was a national championship wrestler at Cal State Bakersfield. 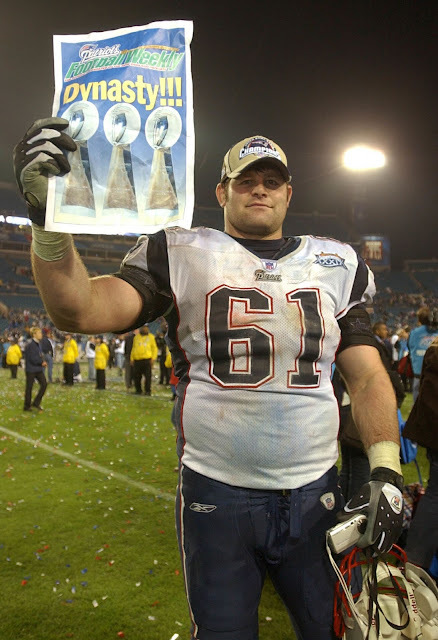 He was an undrafted free agent in the NFL before settling into a 10-year career, seven of which came as a starting offensive guard in New England. And, in true Patriots fashion, he was a three-time Super Bowl champion during that time. On Sunday, New England will take the field in Super Bowl LII against the Philadelphia Eagles in Minneapolis, Minn. Neal, of course, will be watching from his home in San Diego. Neal said he still has an affiliation with the Patriots, cheers for them, and likes it when they win. Even so, Neal said he would be OK seeing the Eagles capture their first Super Bowl championship. This is the second time the Eagles have played the Patriots for the championship. The first was in Super Bowl XXXIX, which was held Feb. 6, 2005, in Jacksonville, Fla. Plenty of interesting faces dotted the starting lineups that evening: Neal, not to be outdone, lined up at right guard. The Patriots also had underrated running back Corey Dillon coming out of the backfield and some familiar faces on defense: tackle Vince Wilfork; linebackers Mike Vrabel, Willie McGinest and Tedy Bruschi; and defensive backs Asante Samuel and Rodney Harrison. As for Philadelphia, Donovan McNabb was at quarterback, Terrell Owens lined up at wide receiver and Brian Westbrook was their versatile tailback. All were star players for the Eagles. Only two starters from either team that night remain in the NFL, however. Kicker Adam Vinatieri is one of them; after an illustrious run with New England, the 45-year-old Vinatieri now plays for Indianapolis. And the second is none other than quarterback Tom Brady, who’s in his 18th season of professional football and seeking his sixth Super Bowl ring with the Patriots. His five NFL championships are tied for the league record. Joining Brady all those seasons has been head coach Bill Belichick. In a league where career spans are short and the turnover rate is high, the quarterback and coach’s longevity is something to marvel. Neal pointed to the structure and organization of the Patriots' locker room as a guiding force: Belichick at the top, and team leaders such as Brady, special teams ace Matthew Slater, and defensive back Devin McCourty all buying into the head coach’s vision. They disseminate that vision to players around them. High-round draft picks and big-name free agents have gone to New England, only to not fit the Patriots' mold and be jettisoned, Neal pointed out. On the flip-side of the equation, 34 percent of the Patriots' current roster consists of players who entered the league as undrafted free agents, according to a recent Yahoo.com article. That is by far the most in the NFL. Neal compared the approach to his days under former CSUB head wrestling coach T.J. Kerr. Neal did not receive a college football scholarship coming out of San Diego High School. Instead, he decided to go the wrestling route. And it didn’t take long for him to find a home. And Neal did in fact accomplish his goal. He competed at the school from 1996-99, winning an NCAA National Championship as a junior and senior heavyweight. He was undefeated those two seasons with an 83-0 combined record. He held a 156-10 career record and was 120-2 over his final three years. Neal holds CSUB career records for most wins and most pins (71) and was a four-time Division I All-American. To capture his 1999 national title, Neal beat Brock Lesnar (the University of Minnesota standout who went on to WWE stardom) in a match that remains a sight to behold on YouTube. Neal spoke glowingly of one of his CSUB mentors — and a Roadrunners wrestling great in his own right — Darryl Pope. Pope was an assistant coach with the Roadrunners and Neal’s workout partner when the team won a Pac 10 championship in 1996. That season, Pope was named National Assistant Coach of the Year by the National Wrestling Coaches Association. Pope said he didn't return the following year due to Title IX implications that resulted in his position being cut from the program. Regardless, Pope would visit the team as a volunteer coach every day following his job as a local sixth-grade teacher. Neal said Pope taught him how to prepare mentally, lift weights and train with a purpose. “He molded me into the competitor that I was able to become,” Neal said. To this day, Neal remains in close contact with CSUB wrestling, which is funded predominantly by boosters and community members. Neal said it costs about $250,000 annually to run and operate the program. Neal has come to Bakersfield for the past seven or eight years for fundraising events, he said. He made it a point to emphasize that he likes the direction of the athletics department and the wrestling program under current CSUB Athletics Director Kenneth "Ziggy" Siegfried. Neal met his wife, Jodee, a Tehachapi native, at CSUB — she was a Roadrunners softball player. Their daughter was also born in Bakersfield, three days after the Patriots beat the Eagles, 24-21, in Super Bowl XXXIX. Neal has moved back to San Diego, with Jodee and their three children between the ages of 10 and 14. All three are involved in sports, and Neal became a man of deep Christian faith as his NFL career unfolded. What separates Neal from his contemporaries, Pope said, is his incredible mental strength and fortitude. “He was one of the greatest wrestlers to walk the planet. Then, he doesn’t just walk on and make it in the NFL. He didn’t just break into the NFL. He busted the walls down,” Pope said. When it was suggested that Neal never made the Pro Bowl, Pope pointed to other obvious credentials on Neal’s resume — the fact he played for, and protected, arguably the game's greatest coach and quarterback for a substantial period of time. Asked where he faced the toughest competition — the wrestling mat or the football field — Neal didn’t take long to answer. As far as Sunday’s Super Bowl, Neal said the Patriots will have to slow down Philadelphia’s defensive front. He said they could do that by running the hurry-up offense, or via trap and wham blocking schemes. Neal is now a retired athlete. He’s currently a man of deep faith, a man whose loyalty to the CSUB program runs deep, and a man who’s never forgotten Bakersfield.